Good morning! 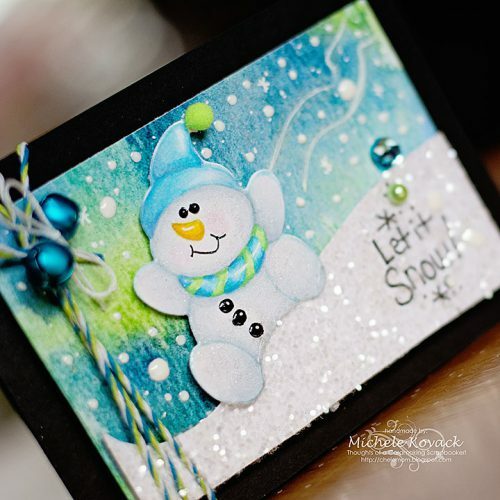 Michele here with a couple of winter inspired cards! (As I am sweltering in this 90+ heat in Chicago!) 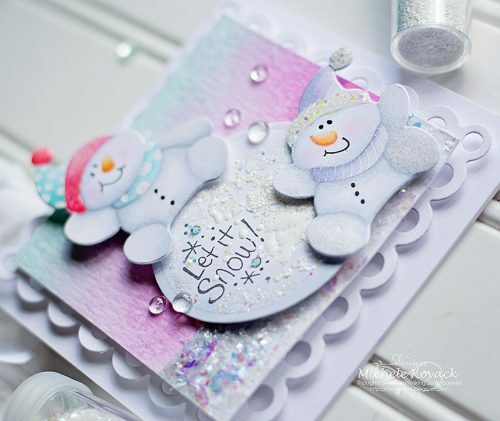 I didn’t officially participate in the Stampendous blog hop a few days ago, but that doesn’t mean I can’t still love on their cute stamps called Snowmen Trio! I did a no-line coloring technique for both cards. They were stamped in a very pale blue, colored, and cut out with the coordinating dies. 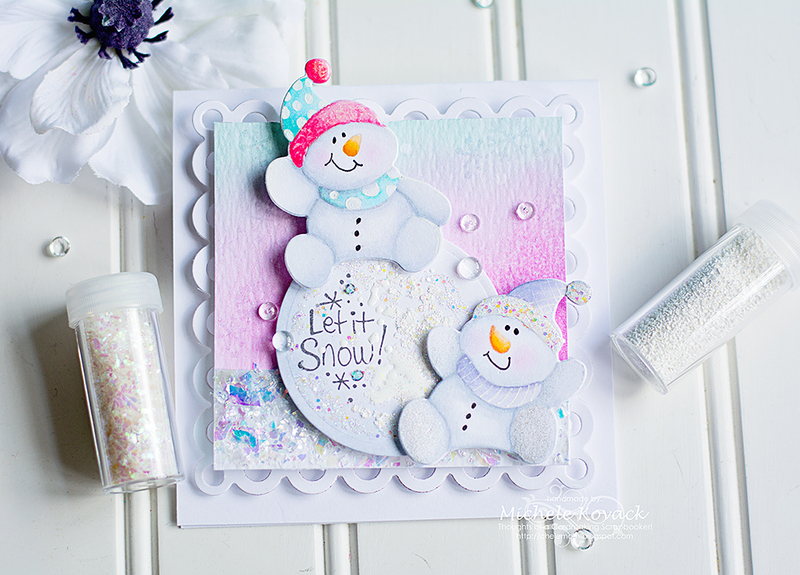 The background of this card was done using water colors and white paint splatters. I hand cut the hill, covered it with glue using the Dual Tip Glue Pen and then sprinkled it with glitter. Next, I adhered the hill and snowman with Crafty Foam Tape. For a final touch, I attached pearls and rhinestones with Dodz Adhesive Dots Mini. I did a similar effect for this card, just changed the colors up a bit for a more frosty, cool look! Instead of a hill for this snowy guy to glide on, I chose a snowball. 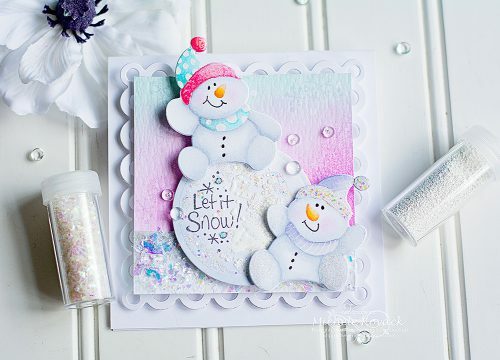 I used some of the glitter and embossing powders from Stampendous! called Frantage Encrusted Jewels! So much fun to just sprinkle and heat ’em up! I used more Crafty Foam Tape to pop up the snowmen and my snowball. Each layer was given additional dimension with Crafty Foam Tape. The clear droplets were adhered with the Dual Tip Glue pen. Supplies: Dual Tip Pen, Crafty Foam Tape, Dodz Adhesive Dots Mini, watercolors, Copic markers, Dew Drops, pearls, Glitter and stamp: Stampendous! 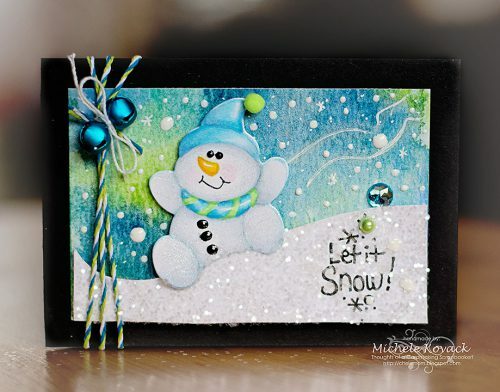 This entry was posted in Adhesive Dots & Lines, Adhesives, Cards, Crafts & Tutorials, Crafty Foam Tape, E-Z Runner® Grand, HomeHobby by 3L, Seasonal Craft Ideas, Tutorial, Wear your Adhesive on the Outside, Winter and tagged Adhesive Dots Mini, Card, Crafty Foam Tape White, Dual Tip Glue Pen, Glitter, Michele Kovack, Snow, Stampendous, Tutorial, Watercolor, Wear Your Adhesive on the Outside, Winter. Bookmark the permalink.